As part of its #PeopleNotPolls coverage of the UK general election, RT's Tom Mellors spoke to a former banker who’s challenging one of Britain’s most prominent Conservative ministers with a pledge to introduce ‘direct democracy’ if elected. The Maidenhead constituency election campaign is in full swing and independent candidate Ian Taplin is out pressing flesh. As I step out of Maidenhead’s Victorian train station, I spot the former banker turned whistleblower laughing with two shop workers near a bicycle rack. Dressed in cycling gear, which Taplin says is part of his image, he pauses briefly to greet me, before returning to his tirade against Maidenhead’s incumbent MP, Conservative Home Secretary Theresa May. Taplin’s canvasing has all the hallmarks of old school street corner oratory, replete with jokes and the odd curse word for comic effect. It’s a far cry from the staid and sterile politicians we find on TV, and his audience seems to be loving it. This is what makes Taplin so fascinating. He has all the gung-ho improvisation of a UKIP candidate, but his message could not be more different. An ex-army officer who served in Armagh, Northern Ireland, during the Troubles, Taplin worked as a banker until 2010, when he was sacked from Lloyds Bank after raising allegations of misconduct. He has taken his original complaint – which he alleges Lloyds Bank failed to investigate – to the Financial Conduct Authority (FCA), which is now carrying out a probe. I worked with Taplin on a documentary about his whistleblowing experience in 2013. 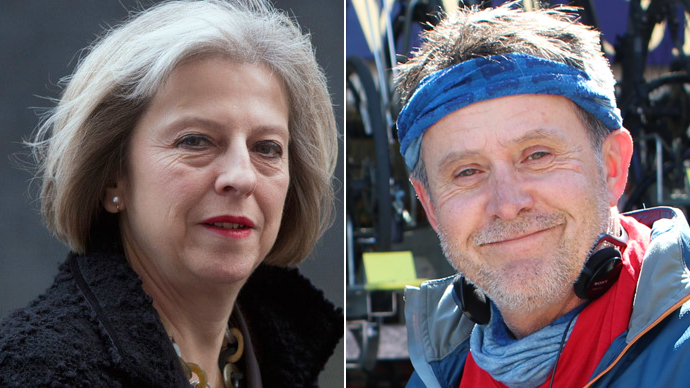 Having taken on the fiscal establishment, Taplin is now fixing his sights on Tory Home Secretary Theresa May. Key to his arsenal is his flagship policy of direct democracy. If elected, Taplin pledges to let Maidenhead citizens decide how he should vote in Parliament through a local voting system. The idea stems from his own dissatisfaction with party politics in the UK. Despite his confidence, Taplin faces an uphill struggle. May has been MP for Maidenhead since 1997 and won the last general election with 59.5 percent of the vote. However May, who also has a background in finance, has cut a controversial figure as home secretary for her defense of mass surveillance by intelligence agencies and her tough stance on counter-terror policy. Since taking over the portfolio, the home secretary has used secretive powers to strip 24 people – some of whom are suspected terrorists – of their British citizenship, according to the Bureau of Investigative Journalism. With Prime Minister David Cameron recently naming May as a potential successor as leader, Taplin has chosen one of Britain’s hardest seats to contest. So who would vote for him? “I predict that I’m going to get a very good support from the young. I reckon I can get 60 to 70 percent of the young to vote for me,” Taplin says, as we settle on a bench in Maidenhead town center. Taplin chose to embrace direct democracy after becoming dissatisfied with Britain’s political parties, which force their members to toe the line, even if it works against their constituents’ interests. Taplin has drawn up a timetable on his website detailing how direct democracy would be implemented in the constituency. Only registered-voters would be allowed to take part in the system and it would be open to people aged 14 and over. “I’m bringing in the young from an early age,” Taplin explains. The MP’s job would be to notify Engaged Persons (EPs) – anyone participating in the local system – of upcoming Parliamentary votes and invite them to participate in an online discussion. If there is enough interest, a public meeting will be held where citizens can debate the proposed legislation. “It becomes an experience, it engages them. And they know they’re talking to somebody who’s listening, not some distant Member of Parliament who’s not even bothered talking to them,” Taplin says. If successful in the election on May 7, he estimates direct democracy would be fully operational by January 2016. Taplin’s disillusionment with British politics goes beyond his critique of the party system. The former financial adviser says powerful banks have infiltrated the Conservative Party, extending their influence into government. He cites a report by the Bureau of Investigation Journalism published in September 2011 which found 51 percent of Conservative donations came from the financial services sector. Taplin proposes state funding for political parties based on party membership numbers, £5,000 caps on private donations, and total transparency to combat the “corporate stranglehold” on politics. The ex-Platoon Commander has little sympathy for the archaic nature of Britain’s political processes, which he sees as out of touch with ordinary life in the country. Taplin’s antipathy for the political system is surpassed only by his anger at the banks. Given his experience as a whistleblower, this is hardly surprising. His story begins in 2005, when he was recruited by Lloyds Private Banking to work as a financial investment adviser in Guildford. Early on, Taplin says he noticed a significant disparity between the way rich customers and poor customers were treated. “The poorer customers were at a financial disadvantage, because they are buying products, for example of premiums in life insurance, which were £100 per month for 25 years,” Taplin says. “The more I looked into it, the more I realized the whole system was geared in this fashion. Well, the law says, and I’ve done multiple exams, that you must treat customers ‘fairly’. That’s all you need. The law says fairly. Is it fair? No, they broke the law,” he adds. His complaint against Lloyds Bank is currently being investigated by the FCA for a second time, the first being dismissed in December 2013. Since being fired by Lloyds Bank in 2010, Taplin has sought the help of Theresa May, his local MP, in pursuing his complaint with the FCA. May’s divided loyalty is Taplin’s main point of attack in this election campaign, which sees one man and a handful of supporters challenge the Conservatives’ star female politician. While he may not succeed at the ballot box, he at least stands a good chance of invigorating debate in the sleepy Tory safe seat.